The whole flying car dream has been getting closer and closer for years now, and a few companies are getting exceptionally close to making their cars a marketable reality. 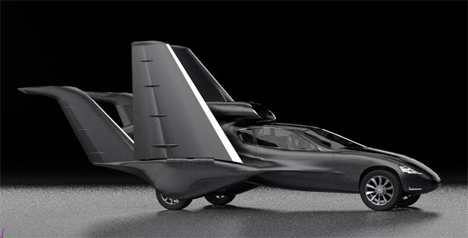 Designers Greg Brown and Dave Fawcett are working on a design they call the GF7, a jet propelled flying car that can reach speeds of 550 MPH in the air. 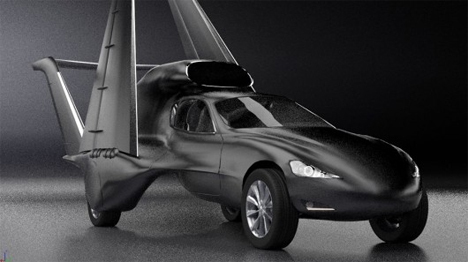 The folding-wing flying car will fly at altitudes up to 38,000 feet but boast the interior of a luxury automobile. The four-seater GF7 is designed to be very easy to operate and will be able to reach 100 MPH on the ground via a 50 kWh battery pack that is recharged by the jet engine during flight. The battery is expected to get 80-120 miles per charge. When in the air, the wheels will retract into the vehicle’s fuselage to streamline the body’s shape. Two vertical tails keep the whole thing stable while it’s flying, as does the 23-foot wingspan. Although it has the look of a winged car, it would be more accurate to call the GF7 a road-travelling aircraft. It would need significant runway clearance to take off and land, and it’s meant to work as a commuter craft within a relatively small geographical region. As you might expect, the price tag for a craft like the GF7 won’t be within reach of most regular commuters. You’ll have to come up with somewhere between $3 million and $5 million (US) to zoom around in your own personal flying car. The benefit over taking, say, a private jet is that you won’t need a large team to coordinate each journey or figure out a place to store your aircraft. You also won’t need to coordinate transportation to and from the airport,which could be a rather satisfying benefit for those who have things to do, places to be, and no time to waste. Although the team have been hard at work on their design, they don’t yet have a prototype. They hope to have one ready by late 2014, and after that there will obviously be years more of testing, regulation-passing, and government approvals to get through. Still, the flying vehicle market seems to be a burgeoning one with plenty of start-ups throwing their hats into the ring. Within a decade the fabulously wealthy people could be cruising up to their private airports and flying themselves around wherever they need to go.